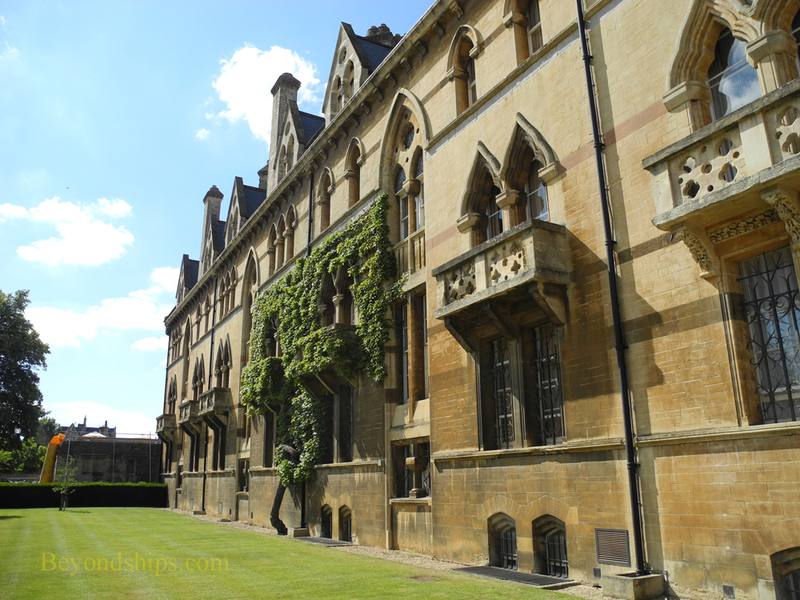 ​Christ Church College is spacious and majestic. It has vast open spaces bordered by architectural masterpieces. 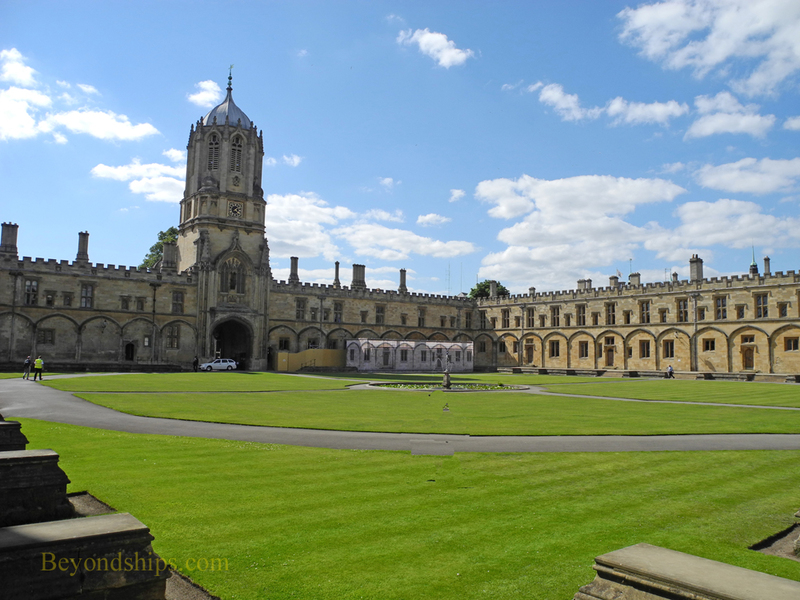 One of the more visited colleges in Oxford, it is often on tour itineraries. Although the college is 500 years old, Oxford was already an established university town when Christ Church was founded. Indeed, it had been so for several centuries. Cardinal Thomas Wolsey, who in addition to being a cardinal was King Henry VIII's chief minister, wanted to establish his credentials as a humanist intellectual. Therefore, he decided to establish a new college at Oxford for the purpose of educating men for the clergy and the government. 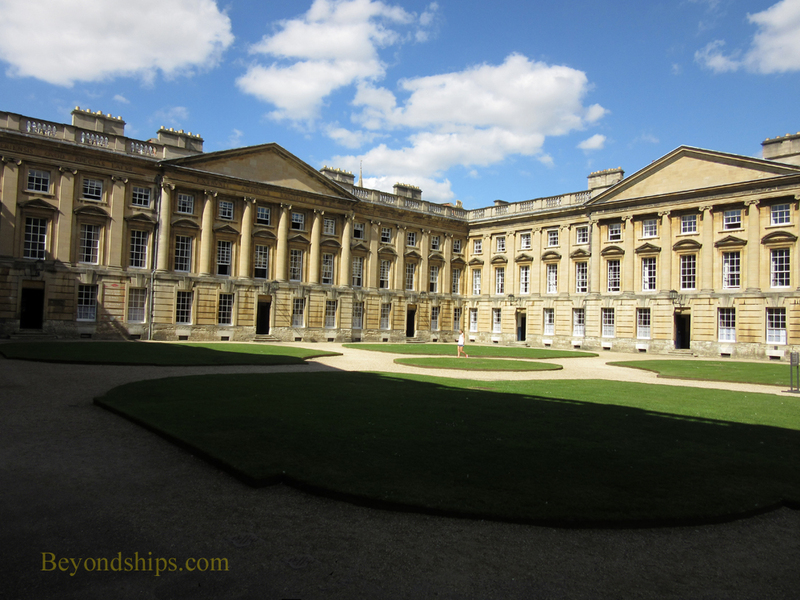 To do this, he closed an existing monastery and used its land and resources to endow the new college. The foundation stone was laid in 1525. The King had even more grand plans for the college than Wolsey. It would be both the cathedral seat of a new diocese as well as an academic center. Accordingly, in 1546, he re-founded it under its current name. Thus, Christ Church is unique in that the college church is a cathedral. Christ Church again became a center of royal attention during the English Civil War. As relations between King Charles I and Parliament deteriorated, the King abandoned London and raised his banner in Oxford. 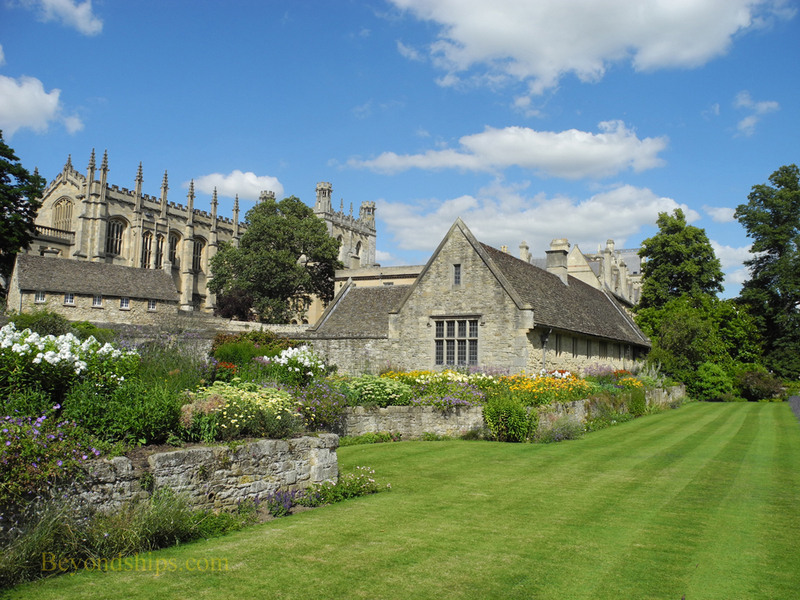 For four years, Oxford became the Royalists principal stronghold and Christ Church was where the King lived and held court. The college flourished after the restoration of the monarchy in 1660. Under Charles II, some of the college's most important buildings were constructed. Christ Church has had an outstanding record of academic achievement. Thirteen British prime ministers attended the college. 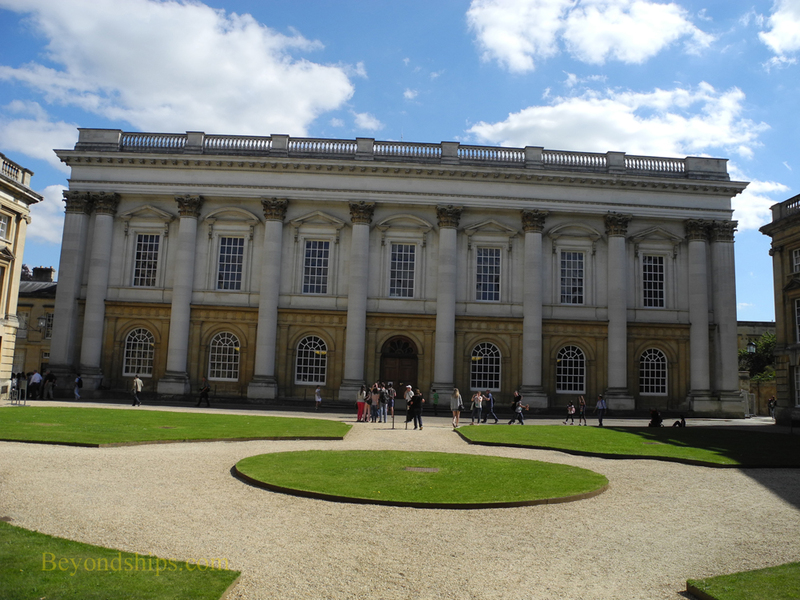 The philosopher John Locke, the architect Sir Christopher Wren, the religious leader William Penn and the scientist Albert Einstein are but a sample of the noteworthy people who have studied here. Lewis Carroll wrote his Alice in Wonderland stories here using the dean's daughter as the model for the title character. The college is referred to in the works of William Shakespeare W.B. Yeats and Evelyn Waugh. It was also used as a location in the Harry Potter films. Christ Church as an important collection of some 300 paintings and 2000 drawings including works by Michelangelo and Leonardo Da Vinci. Maintaining its royal connection, the Visitor of the college is the reigning monarch. The head of the college is the Dean of Christ Church who is appointed by the crown as dean of the cathedral. Above: The Meadow Building overlooks Christ Church Meadow where the college's longhorn cattle graze. It was completed in 1866 in the Venetian style. The building is a student residence and also the entrance for the college's paying visitors. Below: The fan ceiling in the Hall Staircase was installed in the 17th century. 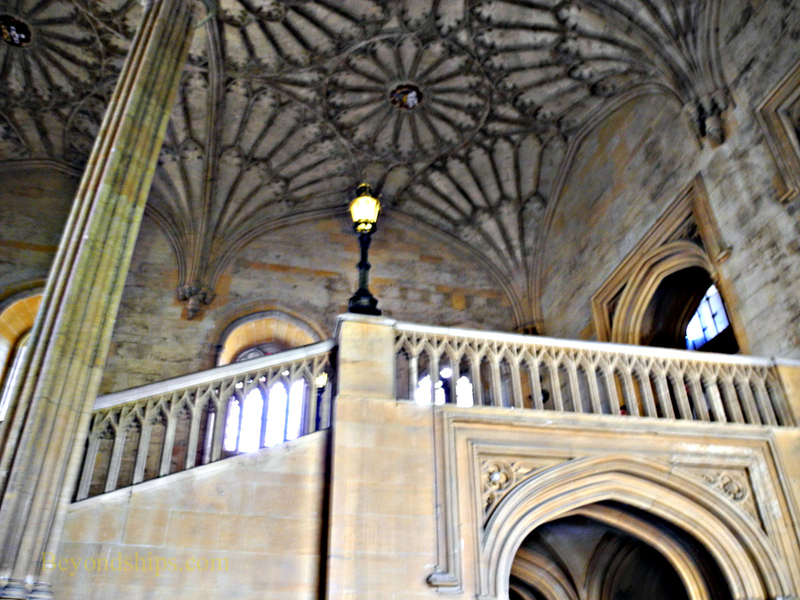 More recently, the staircase was used as a set in Harry Potter and the Philospher's Stone. 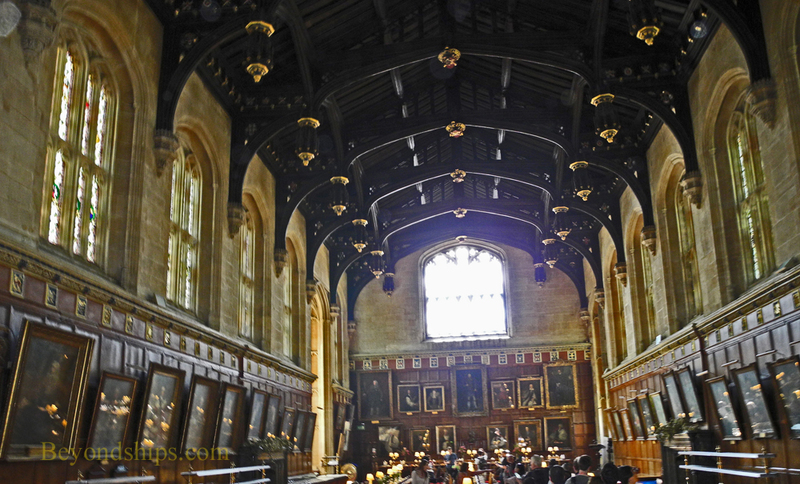 The Great Hall is where the academic community of the college comes to dine each night. 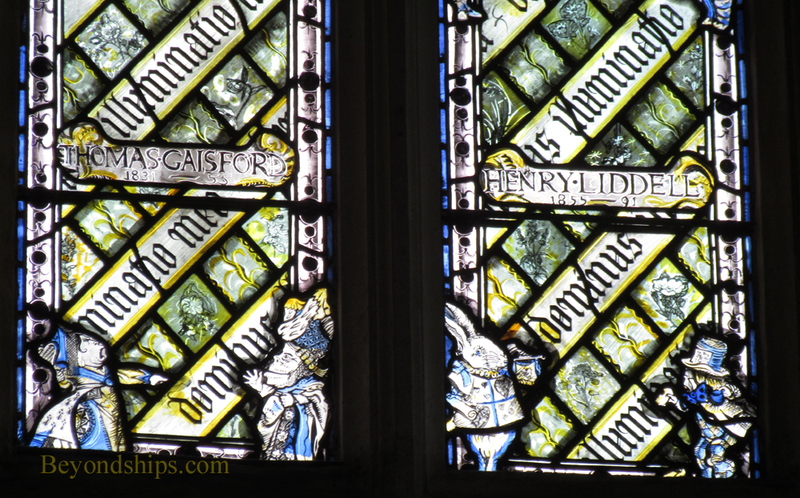 It has a hammerbeam ceiling and stained glass windows that include figures from Alice in Wonderland. Above: The Tom Quad, is named after the Tom Tower, which was designed by Sir Christopher Wren. The bell in the tower is known as “Great Tom.” It is rung 101 times each night in honor of the college's original 100 scholars. Originally, it was rung at midnight as a signal the college's gates were about to close but now it is rung at nine o'clock. Below left: On three sides of the Peckwater Quadrangle are buildings used for student accommodations. They were built between 1706 and 1711 and are considered an excellent example of neo-Palladian architecture. The quad gets it name from a medieval inn owned by the Peckwater family that was once on the site. ​Below right: The Christ Church Library forms the southern side of the Peckwater Quadrangle. The Library was begun in 1717 but not completed until 1772. It has one of the largest collections of antiquarian books in Oxford.